It's a coloring page, it's a reading exercise, and examples of prepositions, all in one! This worksheet, and the rest of the set, gives example sentences of prepositions that your child gets to practise by drawing objects in, on, and around the page. In, on, at, this worksheet goes above expectation to give examples of prepositions. During drawing and art time sneak in preposition exercises! It's easy and fun. No matter what grade your young reader is in a preposition crossword will bost his language skills, vocabulary and spelling ability. 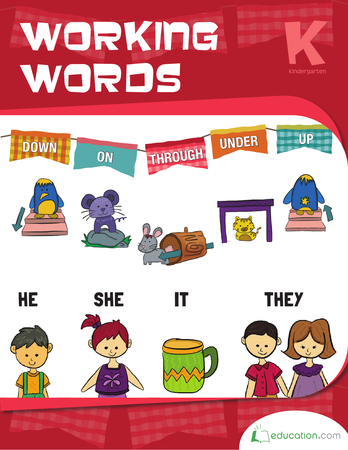 This worksheet gives young kids concrete practise with plural forms of words. 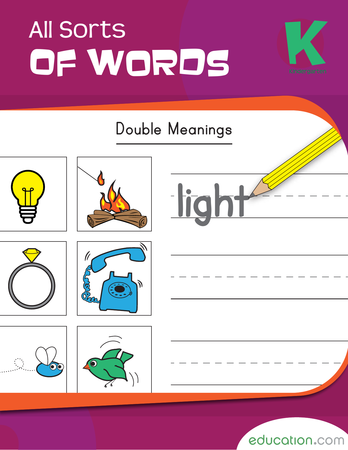 Practise double meanings, nouns, verbs, and rhyming words in this appealing workbook!